Finding the best home school science curriculum for your family can be challenging. There are so many different publishers like Apologia Science and ABeka Homeschool Science to choose from. Also, there are the various teaching methods to consider. Teaching science is one of those subjects where you truly get out of it what you put into it. So, if you bring enthusiasm to the subject, generally your child will be enthusiastic about learning it, too. You can select resources that use "real books" to introduce science or select more traditional textbook style of teaching. And, of course there are the more interactive, exploratory or lab-based programs such as Great Science Adventures for Homeschool by Common Sense Press. Don't make your science instruction too complicated but keep it challenging enough to create a desire in your children to learn more about the topics. We have used numerous science resources over the years such as Rainbow Science, Bob Jones, ABeka, Apologia, Christian Liberty Press’ Nature Readers, Moody videos, and Considering God’s Creation. 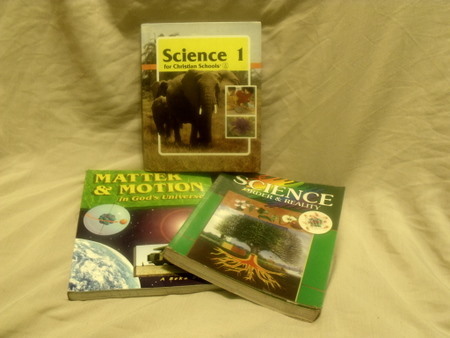 Prices vary for the different levels of science books. Understandably, the home school high school science texts are more expensive than those for the younger grades. I would encourage you to search for used homeschool books at your local homeschool curriculum fair or purchase them online. Consider the various homeschool science curriculum options carefully to determine the best fit for you and your children. Children thrive while using certain formats while others are not as appealing to them. Remember, that whichever method you choose just be certain that the homeschool materials are interesting with fantastic illustrations to make your child’s learning experience "come alive!"